In a word: A stash of secret acorns. JM ate the grilled ham and cheese with a lemonade. The bill was $17, or $8ish/person, plus tip. JM and Nichole both gave Squirrel's Nest a B+ (see our grading rubric). Squirrel's Nest is a bar in the country between McFarland and Stoughton. We think we'd tried to eat here once in the heat of a long-ago summer, when the place was running under a different name, and were told the grill was off due to the heat. We had no such problems this winter day. First of all: reputation. Squirrel's Nest is known for hearty and tasty breakfasts. Sadly this didn't work for our schedule, but from what we saw and heard, it could be easily believed. Secondly, they use Knoche's meat which is great. Couple that with the assortment of Koops mustards our kind server brought tableward (including an added bottle of Arizona Heat per her recommendation) and this place was well on its way. 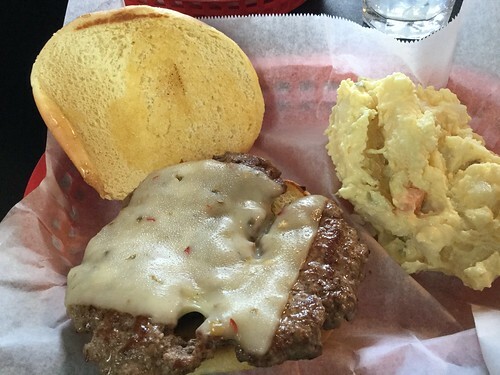 Nichole's burger was served on a buttered soft bun with a super pepper jack cheese and a side of, get this, potato salad. 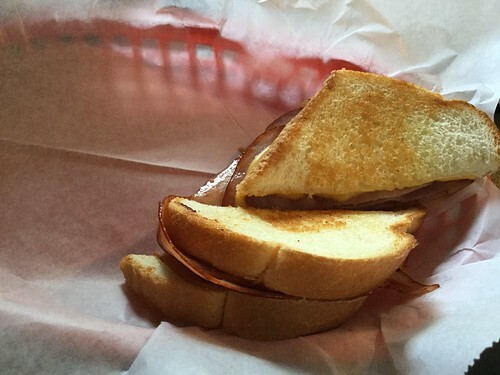 JM's umpteenth grilled ham and cheese was nicely prepared if a little small. The toasted bread was so good, though, and the mustard add-ons helped. Our server was indeed nice and thoroughly patient, but the service here is not fast. We'll probably return someday for breakfast, if it can keep up with these lunches. We're sure many in McFarland and Stoughton don't known about this decent burger option halfway out of town, but it's worth a trip.